Simplicity 2121; ©1957; Jr. Misses' and Misses' Top, Shorts and Wrap-Around Skirt: Midriff top has low V front neckline and pointed collar. Extensions fasten into knot below bust. Kimono sleeves may be short or 3/4 length. Top-stitching detail may be used. Shorts have soft pleats in front, openings at lower edges of side seams, top-stitching detail and side zipper closing. Full wrap-around skirt is gathered. Waistband fastens with 2 front buttons. Pockets in side seams are optional. 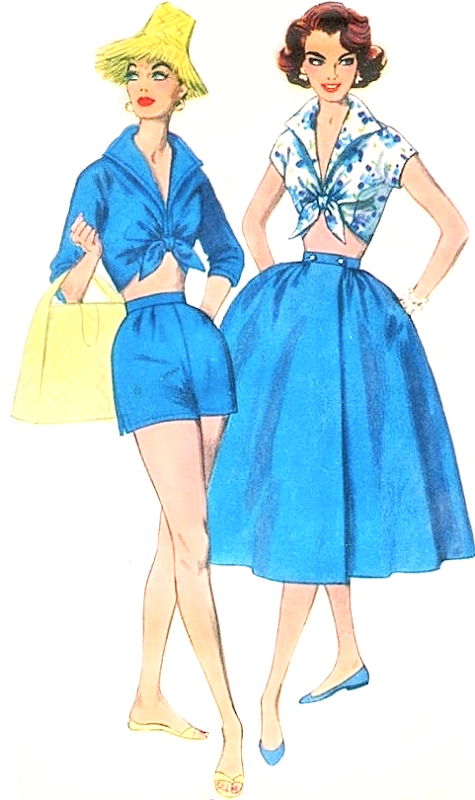 If you enjoy vintage sewing patterns, especially the 1940s and 1950s, you may wish to book mark us and visit often. We list several times a week and keep adding to our ever changing inventory of all original vintage sewing patterns from the 1900s up to the 80s. WE SHIP WORLD WIDE! Our international shipping is most reasonable! We combine shipping to save our customers money ! We have free layaways, don't let that pattern get away on you! All prices are in USD. For your shopping convenience we accept the following payment methods: Traditional credit cards: American Express, Discover, MasterCard and Visa. As is the tradition with fabric and pattern stores selling sewing patterns, we do not accept returns, all sales are final, as almost everything we sell is easily duplicated or reproduced. We cannot be held responsible for time sensitive delivery, we hold no power over the postal system as to how quickly they deliver. We usually ship within 3 business days however during peak times it can take up to 10 business days before your order is shipped.We ship both from Washington State and British Columbia. We are always happy to work with our customers so the purchase is an enjoyable one.